The SGFOA assisted two families with their Christmas wish list in 2013. As you can read in the letters, the families were very thankful for our member's assistance and generosity. As always, the SGFOA members stepped up to help those in need. Thanks to everyone for bringing band-aids, toys and helping with the adopt a family for the Salvation Army. The SGFOA will be having a "Treasure Chest" toy drive for the Children's Cancer Center at Healthpark on Monday September 26, 2011 at the membership meeting, 7PM at Ft. Myers High. Please bring small toys that children can choose when they are in for treatments and care at the center. Please contact Alan Walker with any questions. John Mantica introduces Ben Nordstrom to Lemon Bay and Port Charlotte captains on October 6th, 2011. Ben is currently undergoing treatment at the Children's Cancer Center at Healthpark and was the honorary referee for the game. Mike Morse will be collecting Halloween candy again this year for the events to be held at Oakbrook of Labelle. They host a fun and safe place for kids to celebrate Halloween and trick or treat. Please bring candy donations to the next board meetings; September 26 and October 10th, 2011. Please contact Mike Morse or a board member for any questions. This spring the SGFOA delivered a new widescreen LCD Hi-Def TV and Wii gaming system to the Children's Cancer Center at Healthpark. The center was very thankful for the much needed items to give children a fun indoor activity during a very difficult time in their lives. Funds for the items were made possible through the SGFOA Memorial Fund which is from contributions by SGFOA officials. HUGE thanks to all the SGFOA members for donating approximately 700 pounds of non-perishable items for the Harry Chapin Food bank of SWFL. Great job everyone!!! We surpassed last years count by donating 689 boxes of band aids to be used at the Southwest Florida Children's Cancer Center at Health Park. This small item makes a huge impact on the daily challenges of every patient, some of whom have shared the field with us as Honorary Officials on Friday nights. Thanks to all SGFOA members for their contributions. Mike Morse and SGFOA President Mike Brown collected a large amount of candy for Oakbrook of Labelle, which hosts a community Halloween event each year in Labelle. The event provides a fun and safe place for kids to spend their Halloween. Members are encouraged to donate candy at our next meeting on October 18, 2010. 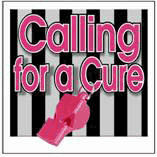 If you notice that the contest officials are using pink whistles during the contest, this means these officials have agreed to make an individual donation in this effort. If this is the case, the FHSAA kindly asks that you acknowledge this participation through the public address announcement found below. Please make the announcement a minimum of two times during the contest. For football, make the announcement between quarters. Honorary Referee Joseph West with his crew at Estero; Golliher, Brown, Thomas, Hobbs and Broyles. experience for patients at the Lee Memorial Pediatric Cancer Center. 28th, 2009, participating in the pregame with coaches, coin toss and a front row seat for the game. Special thanks to Fred at Honigs for providing authentic officials shirts for our honorary officials. In addition, the SGFOA donated over 500 boxes of band-aids to the center and made a monotary donation to Barbara's friends. The SGFOA donated over 1,000 lbs of non-perishable items to the Harry Chapin Food Bank in Ft. Myers on Monday, August 24, 2009. SGFOA Community Relations Committee, Jim, Jody, Allan and Ed with Joice from Harry Chapin. The SGFOA will be Making Strides Against Breast Cancer on October 17, 2009 at the Ft. Myers 5K event in the River District. The walk/run starts and ends at centennial park. Members, please visit our team web site to join or make donations.